Digital IP-based closed circuit television (IP-CCTV) systems offer mission critical facilities numerous benefits. For one, an IP-CCTV system brings all the information and control to a single point—all in an easy-to-use, seamless interface that can be controlled as easily from the control room as from a home computer. In addition, an IP-CCTV system can be integrated with all other security systems within the mission critical facility—driving costs down and increasing efficiency, reliability, and scalability. With such benefits, it’s easy to see why IP-CCTV systems are the future of mission critical facility monitoring. Yet most mission critical facilities cannot afford to make an overnight switch to digital after years of heavily investing in analog equipment. Instead, facilities are looking to seamlessly, and painlessly, transition from analog to digital equipment over a period of time. And that transition can begin to take place immediately—all while continuing to use existing analog equipment. A mission critical facility manager simply connects the existing analog equipment to an existing network. Mission critical facilities already use a network for transmitting data, communication, and/or applications. Adding the CCTV system is like adding another computer at an office. Traditional CCTV systems use dedicated, point-to-point cabling. 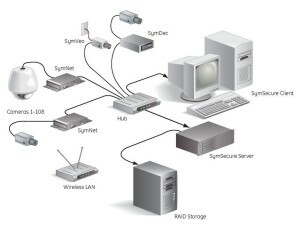 A networked IP-CCTV system, however, employs standard LAN/MAN/WAN/Internet as the backbone for transporting images and information. The networked system transmits video, audio, and data without the use of dedicated, physical infrastructure to connect the camera to the recorder and/or monitor. It does all the same things as a traditional analog system—only over an existing network. With a networked IP-CCTV system, you gain the ability to work in partnership with all the other components on the network. The system uses communications protocol and file formats that are widely available and accessible by other devices on the network. You could even transmit video across the Internet. In a nutshell, users of networked IP-CCTV systems will realize true integration, utilization of existing infrastructure, scalability, reduction of installation costs, information flexibility, and unification of data and video technologies into a single infrastructure that is supported by today’s and tomorrow’s technology path. To connect existing analog equipment to a network, you simply install a software program or, as some manufacturers call it, a hybrid IP platform. You don’t need to invest in new equipment. You don’t need to run dedicated video cable. With the platform and its analog-to-digital encoders and decoders, you continue to use the cameras and monitors you already have. The platform is able to communicate with existing analog cameras as well as both hybrid and traditional DVRs. A hybrid IP platform offers the best of both worlds: the power and flexibility of networked video systems with the reliability of the tried-and-true technology of analog camera systems. It is a viable and economical solution to bridging the gap between existing analog equipment and the digital technology of tomorrow. » What network design does the facility need? Ethernet is the primary network being implemented today, but it is either designed in a star or a bus structure. Know these two types and determine which one is best for your facility. » How big do the images have to be? » What’s the best compression technology for this installation? » How many frames per second are needed? » How high of a resolution is needed?